Trail runners and Road runners may both get around using their legs and their feet, but when you ask them if there are similarities in the two disciplines, that’s usually where the conversation ends. Whether you prefer the road or the trail, when you find yourself surrounded by mountains at Cathedral Peak Hotel, your options narrow very quickly, and you find yourself in some of the most beautiful scenery in the world, running along some incredible trails. We recently found some great tips for Trail Running in a post on Runners World, and have highlighted some of them below. Take a look at the full article on Runners World to see all 21 Tips. No single trail is the same. Every trail has its own unique terrain and challenge. Leave your ego at home. Running off road can be exhausting at first. It’s wise to leave your ego at home, slow your pace and focus on finding a new rhythm. Keep it safe. When heading out to the trails, make sure to run with your buddies, tell someone where you are going and which trail, and take a cell phone with you for safety (at Cathedral Peak Hotel sign the register at Reception before you leave and when you get back). Know the rules of the trail. Yield to other trail users (equestrian, hikers, mountain bikers). Uphill runners should yield to downhill runners. Leave no trace, and don’t litter. Keep your eyes on the trail. It can be tempting to look at the nature around you, but doing so can quickly lead to tripping and falling. Slow down and smell the roses. Running on trails can be a lot more demanding than the roads, especially if it’s a technical singletrack trail with roots, rocks, and other fun obstacles. Change gears. Adjust your pace according to the terrain, and maintain a consistent effort level as you climb uphill. When in doubt, walk. If you’re going to weave trail running into your life, it’s wise to invest in a pair of trail running shoes. They differ from road-running shoes in that they’re lower profile (lower to the ground), which reduces the chance of ankle rolls with a high heel. Take care of your trail shoes. Remove the insoles, wash off the mud, and stuff with newspaper or paper towels to dry. Although many trails provide shaded routes, it’s still wise to wear sunscreen. Sunglasses, dark or light, will protect your eyes from tree branches and bushes. Wearing a hat and bug spray will help prevent insect bites and ticks. Carry fluids. Bringing hydration with you on a trail run is a must, as you never know how long it is going to take to complete the workout. Run like MacGyver. For steep, hilly, or mountainous trails, consider using trekking poles to boost aid with balance, reduce wear and tear on your body (four legs good, two legs bad), and boost your hill-climbing strength. Take short, quick steps when going up hills, and use your arms. Some hills are meant to be walked, especially on the technical trails. Tell your ego that most ultra-runners walk the hills and run the downs and flats — it’s a trail thing, and it’s okay to walk (promise)! Keep your arms (elbows) a little wider for added balance on more technical trails with tree roots and rocks. 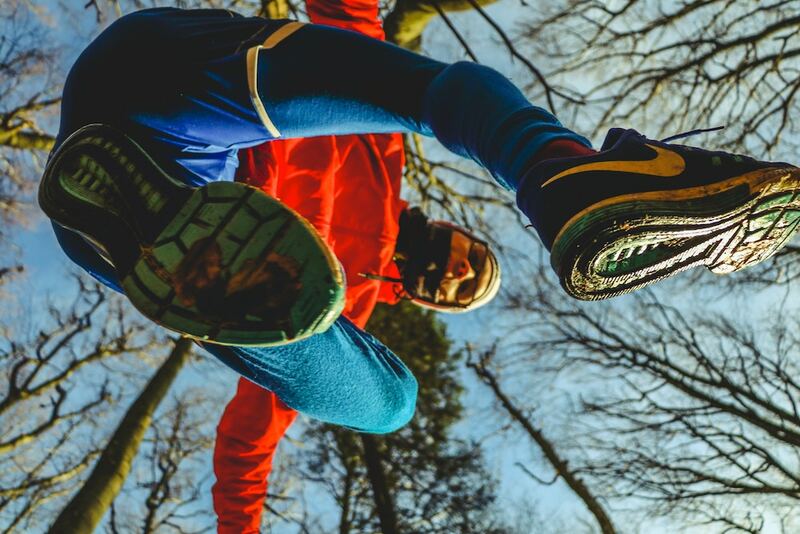 It can be tempting to hit the trails frequently at first, but it’s wise to allow for adequate recovery, as trail running–especially hilly, technical runs–will tax your body more than you may feel. When in doubt, slow it down or walk through it. Most importantly, have fun on the trails, but be careful! You know what they say about trail running – once you get on the dirt, you never want to go back to the roads.